Hi and welcome to my stop on the Plum and June New Blogger Hop! I’m Sarah, a 27-year-old married engineer, cat feeder, and quilter (of course). I’ve really only been quilting for about two years now, though I’ve known how to sew for what seems like most of my life. My mom got me started with cross stitch and crocheting, then I picked up knitting and spinning (that’s spinning yarn, not the gym torture). Of all my hobbies, quilting is by far my favorite. There are no worries about running out of yarn while casting off, no squinting at tiny little charts, and fast results (most of the time). Take the A-Train – so much fun huggable texture! My style will always lean towards bright and happy. I’m a Southern Californian transplant in New England – someone has to be cheerful around here! I bet you’re wondering where the blog name comes from? It’s not the normal pun on sewing, and without that yellow quilt at the top, you might not even know its about quilting! The name comes from my husband, who very early one morning told me to shut up (I’m a bit of a morning person), which I did. Less than two minutes later, he told me to shut up again. Indignantly, I told him I didn’t say anything. “You’re smiling too loud.” This space is where I smile loudly. Can you hear it? BMQG Swap – wall organizer. Love these colors! All my quilts are my favorite (sound familiar? ), but the one I’m most proud of and maybe love just a bit more than the others is Take the A-Train. It’s also the one I’ve blogged about the most, so maybe that was a clue. There are lots of other stops today, but before you head off to meet all the other awesome people, I have a few questions to answer. Blogging Tip: Make it easy to follow your blog! You could have the most drool worthy quilts and a great witty banter, but if there are no buttons to click, it’s really hard to follow you. I would say at least include a button to follow by email, bloglovin, and feedly. Not everyone uses bloglovin, and being mindful of that is important. Quilting Tip: I quilt backwards from sewing — I pull the quilt towards me. It keeps me from quilting over stitches I’ve already done, and makes it easier for me to be consistent. It also seems to be easier on my shoulders, but that might just be in my head. Dream Vacation Spot: The Cape. I’ve lived in Massachusetts for nearly ten years, but have not been to The Cape. However, that’s going to change soon! Hubby and I are finally taking a honeymoon this year to The Cape! He says I’m not allowed to bring sewing though….we’ll see. My ‘helper’ – he approves all fabric choices, whether I ask or not! Now, go forth and get acquainted with the other wonderful bloggers posting their life stories today!!! And make sure you come back for next week’s list too! That’s a lot of WIPs although I tend not to count mine so who knows, I probably have even more so no judgement here. I know what you mean about FMQ ing backwards – it does give you a clear path to not run over yourself. Nice to meet you – I’ll be hopping in July! 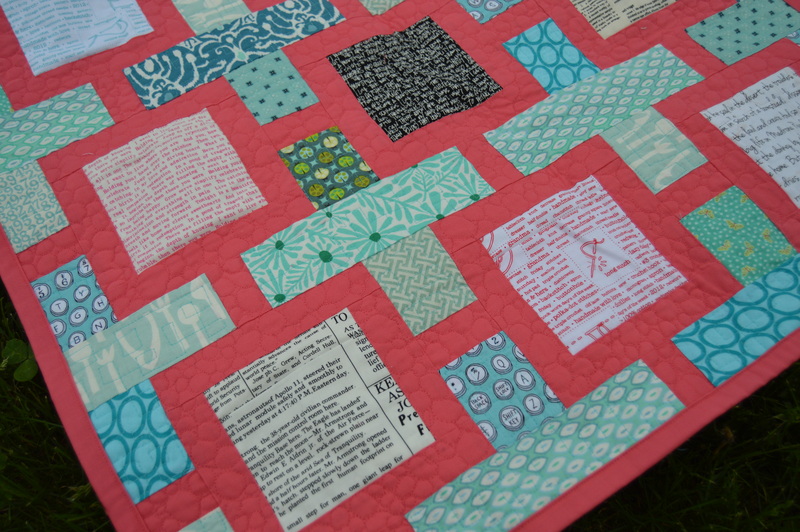 Love love love your take the a train quilt, now I’m going back to read more about it. It’s nice to see something so bright and sunny. I love your “smiles too loudly” title! This is a perfect place to be as loud as you want and smile big! 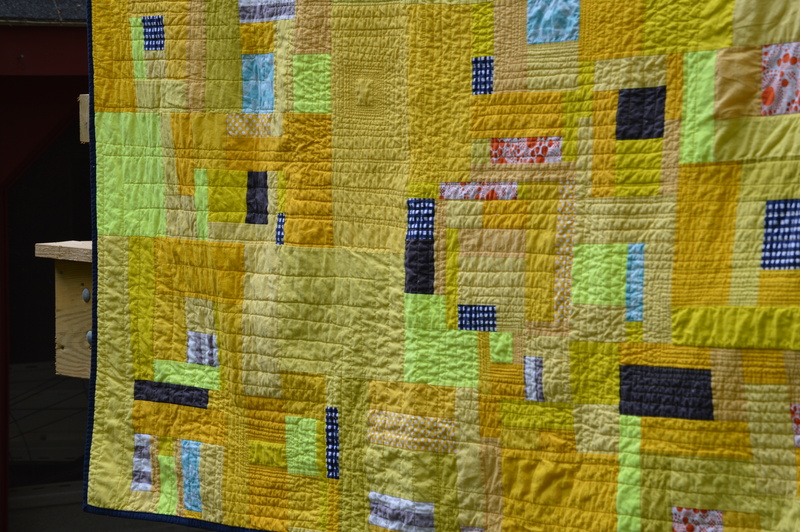 Your yellow quilt is definitely one of my most favorite quilts of all time. It actually makes me smile every time I run across it on the internet – which now seems perfect given your blog name story! 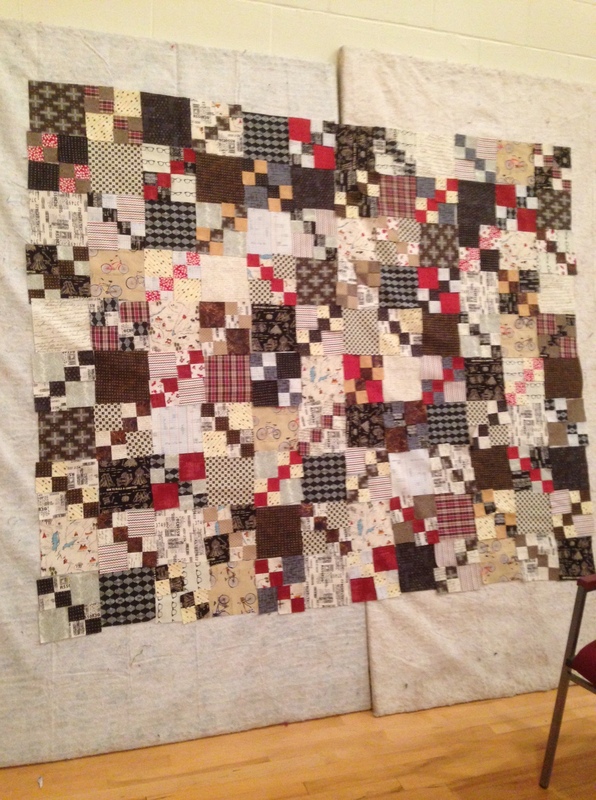 I think with WIP bug is a widespread ailment across the quilting community! Feeling better about my own WIP collection now…. I followed you here from Plum & June – I’m not playing along this year but I did last year and it was a great experience. It was nice to meet you and I like the story of your blog name. Your furry quilt inspector is quite sweet. And, no, I can’t help you with a WIP strategy, but let me know if you find one! Your take the A-train quilt is beautiful. I’m so thrilled to get to know you a little. Nice to meet you. Yes, I am three weeks behind in my blog reading. I found you through the new blogger blog hop. I have probably said something similar to my husband like “stop breathing it’s annoying me”! I really love the color yellow (in fact it was my favorite until I started gravitating towards gray) and your “take the A train” quilt is gorgeous – glad its your favorite and it reflects you!! Good Luck on the WIPs – after every finish I treat myself to new fabric and it seems to be working!!! Hi Sarah. Found you through Plum and Jane blog hop. As soon as your page opened, I thought…I know that yellow quilt! Nice blog, cute kitty.